Ten sheets of 118 lb. heavyweight paper for watercolor and wet techniques. Use for cards, paper crafts, collage, mixed media and more! 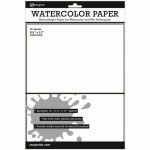 This paper provides a perfect durable surface to stamp; ink or color with water-based markers. Choose your favorite side to create on-smooth finish for detailed design work or textured for creating layers of color. Resists buckling and dries quickly.